KIEV, Ukraine -- Mykola Nyzhnykovskyi was like any typical 11-year-old boy — ever curious, adventurous, and at times a bit goofy. Doctors from the Canadian Medical Mission to Ukraine operate on Mykola Nyzhnykovskyi in Kyiv last fall. But last August, his curiosity got the better of him and changed his life forever. While playing tag with a few friends and his four year old brother, Mykola found a grenade on an open field used for military training in eastern Ukraine. He didn’t know it was live. “We put it in the middle of the road and then a friend of mine pushed me towards it. I stepped on it and it exploded,” the boy recounted from a hospital bed in Kiev, Ukraine. Alla, Mykola’s mother, heard the explosion. Doctors saved Mykola’s life but he lost both legs and his right arm. He also suffered serious internal injuries and massive facial and cranial trauma. But what he didn’t know for months was that the blast, while wounding his friends, killed his 4-year-old brother, Danyo. His mother kept that a secret, fearing the news would devastate him. For two months, Mykola lay in a hospital bed, his Ukrainian doctors lacking the expertise and the tools to help him fully heal. His future looked bleak — that is until a Canadian medical mission to Ukraine got word of his situation. “The story was horrifying and his injuries were devastating,” Dr. Oleh Antonyshyn said in an interview with CTV’s W5. Antonyshyn is the lead surgeon and chief organizer of the Canadian Medical Mission to Ukraine. 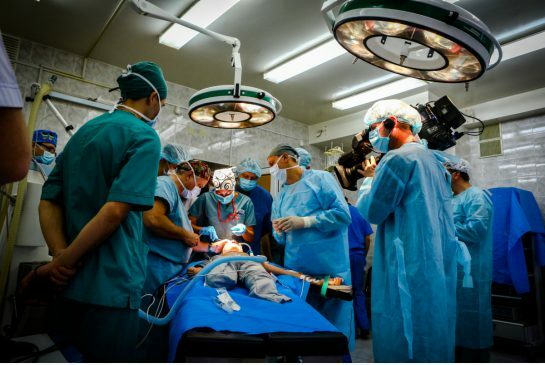 A proud Canadian of Ukrainian heritage, he headed to Ukraine in late October for a third sojourn in a little more than a year, this time accompanied by a team of 21 medical professionals — surgeons, anesthesiologists, nurses and one occupational therapist — all volunteers. Their week-long mission, organized by the Canada-Ukraine Foundation, was funded by the Canadian government to the tune of $500,000. The money will be used to operate on Ukrainian soldiers wounded in the ongoing war with Russian soldiers and separatists in eastern Ukraine. In the week that W5 was there, three operating tables were going non-stop, repairing the horrific wounds to the faces, skulls and arms of 38 former soldiers at the sprawling military hospital in Kiev. And while every soldier’s story is heart wrenching, it was the tragedy of Mykola that captured the hearts and minds of every volunteer from Canada. However, Antonyshyn wasn’t sure the Ukrainian military would allow Mykola to be brought to the medical mission even for an assessment. From the moment the boy was wheeled into the clinic, the Canadian team felt they had to help however they could. Yet while the doctors weren’t able to address Mykola’s amputated limbs, they knew they could deal with the wounds to his face and skull. “It’s crucial because he literally doesn’t have part of his skull,” Antonyshyn said after examining the boy. After overcoming red tape and getting the green light, two days later, Mykola was being prepped for surgery. That is until he met Dr. Adrian Hawaleshka, an anesthesiologist from Winnipeg. “What was really difficult was when they brought Mykola in,” Hawaleshka said, wiping tears from his eyes. But like any good professional, the doctor was careful not to betray any signs of sadness while treating Mykola. His goal was to put his frightened patient at ease. “I’m lucky that I give a fair amount of anesthetics to kids. And kids are really interesting. You can joke around with them more than you think. In the final days of the mission, a profound sense of gratitude emanated from the halls and rooms all along the hospital ward. There were lots of hugs and smiles and lots of tears from patients and their families. For patients like Roman Illchyshyn recovering from his second surgery by the Canadian doctors, to heal a wound in his jaw, the words came easy. “All I want to say is thank you. These people are part of us. They’re our people even though they live a long distance from us,” he said from his hospital bed. The medical team brought 350 kilograms of supplies with much of it being left behind, including a full set of surgical instruments — a gift to the hospital. And the last patient to be seen by Antonyshyn before the team heads back to Canada is Mykola. Just four days earlier, surgeons removed a piece of shrapnel from his chin, rebuilt his lower lip, removed some scars on his face and put a titanium mesh screen onto his skull. Dr. Tara Teshima assisted Antonyshyn in the operating room. Five weeks later, that hope for a good future took a big leap forward. Word of Mykola’s plight came to the attention of Dr. Reggie Hamdy, an orthopedic surgeon at the Shriners Hospital for Children in Montreal, and he immediately offered to bring them to Canada. It was an offer beyond anything Mykola and his mom could have ever dreamed. Since arriving in Montreal Nov. 30, all his lingering medical issues are being taken care of. He’ll eventually receive prosthetic limbs and physiotherapy over the next few months, which will dramatically improve his life. And all his medical costs are being covered by the Shriners Hospital, while the Ukrainian community has provided them with the use of a condo. “A triple amputee is quite severe,” Hamdy said. For the Canadian doctors in Montreal and those who volunteered in Ukraine, there could be no greater accomplishment than to see this boy from a war-ravaged country have a chance to run and play again. But first, Mykola faces a long road to recovery.